In some ways, Pablo Carbajal of San Mateo is like many other 25-year olds. He’s pursuing higher education. Pablo likes to play music and keep active with sports. He dreams of a career, home ownership and a family. In other ways, Pablo’s life is different from many his age. 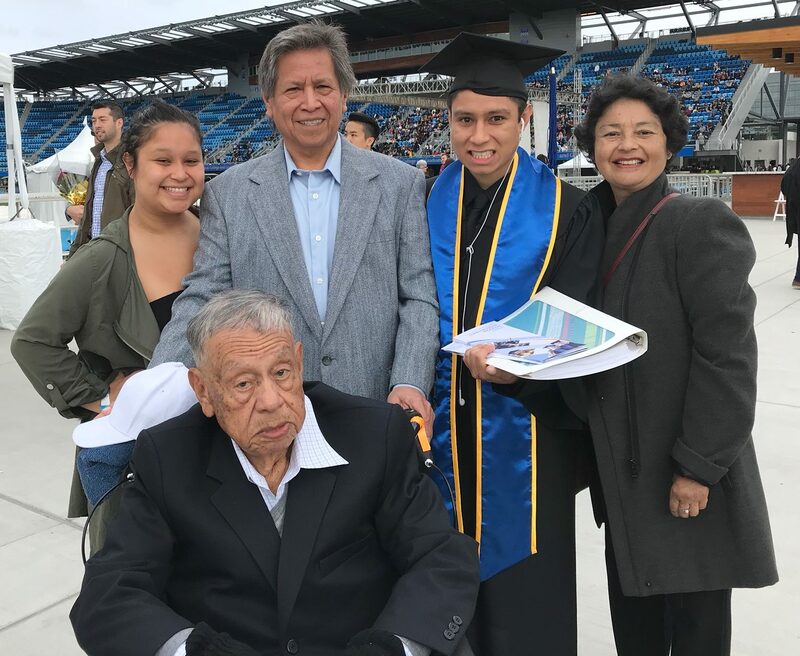 Scheduling medical appointments, spending weekends at a senior housing community and managing his grandfather’s finances are all regular parts of Pablo’s week. Pablo is the primary caregiver for his 86-year old grandfather, Jorge, who is living with dementia. Pablo’s parents and grandfather came to the United States from Peru. Pablo remembers Jorge as being shy and reserved when he first met people. But once he got to know someone, he was energetic and loving. 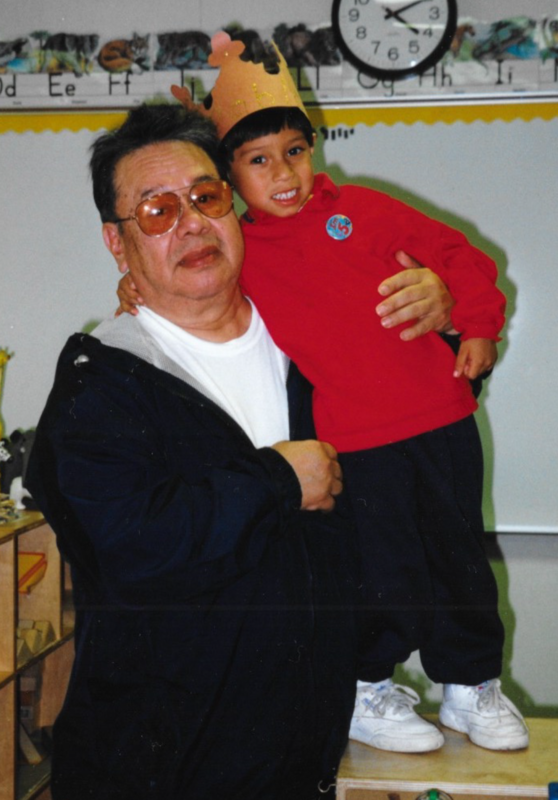 About 10 years ago, Jorge moved into a senior apartment complex in South San Francisco. Pablo was in school and his parents both worked full-time. Pablo and his family would visit Jorge on weekends. About five years ago, his family noticed that Jorge was becoming forgetful. Jorge would joke about it. Then they discovered that Jorge wasn’t taking care of his finances correctly. He had forgotten to pay some of his bills. Pablo stepped in to help manage his grandfather’s finances. “I think that’s when we realized that this was more serious,” recalls Pablo. After seeking medical care, Jorge’s physician diagnosed him with dementia. After receiving the diagnosis, the family knew that he would need more support. Pablo’s parents, Gloria and Fernando, both work full-time. Either Pablo or his younger sister, Gloria, would need to take the lead. Being a full-time student, Pablo admits that caregiving is an ongoing challenge. In between classes and studying, Pablo schedules medical appointments, makes sure his grandfather has his medicine and manages his finances. Some days, he has to rush from class to pick up his grandfather, take Jorge to a medical appointment, take him home and then study. Pablo wants to pursue a career in business or project management. 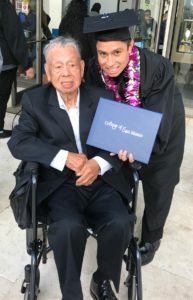 He is currently working towards a second bachelor’s degree in computer science from the University of San Francisco. Besides caring for his grandfather and going to college, Pablo is studying to take the Graduate Management Admission Test. He plans to apply to MBA programs. Pablo visits his grandfather a few times during the week, as well as for longer visits on the weekends. He enjoys the time he spends with Jorge. Pablo’s parents see that Jorge’s dementia is getting worse. They worry about the future. Part of Pablo’s caregiving role involves making sure Jorge is safe and comfortable, so that his parents don’t worry. The biggest challenge for Pablo’s extended family is a lack of awareness about dementia. He feels that this can be common in the Hispanic/Latino community. Jorge recently went back to Peru for the first time since being diagnosed with dementia. He didn’t recognize some close family members. It was difficult for Jorge and his loved ones. Pablo has noticed that at family gatherings, relatives may say that Jorge is just forgetful. When they sit down and talk to Jorge, some of the family members have noticed that he’s getting worse. 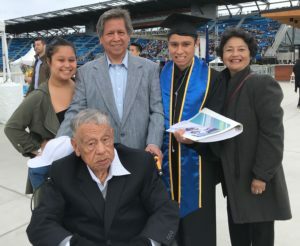 Family members have shared with Pablo that they didn’t know how bad dementia could get and how sad they are about the progression of Jorge’s symptoms. School isn’t the only place where Pablo is learning. When asked about what he has learned that might be helpful to other caregivers, Pablo provided some great tips. Pablo encourages other caregivers to ask questions. During one of his visits, Pablo asked the doctor if there was any help available for his grandfather. The doctor connected Pablo with a social worker, who gave them a list of community programs. This was how Pablo found the Alzheimer’s Association. He reached out to the Helpline and had a care consultation with Liliana, one of our program staff. She asked questions about what the family needed, provided education and helped connect Pablo with services available to support him and Jorge. Pablo was very open to the information that others shared with him. It has helped him better meet Jorge’s needs. Pablo is trying to utilize more community services. It can be challenging to set things up, since he is often in class when agency staff call. Pablo encourages others to ask around and see if there are ways to qualify for services that you might not normally be able to afford. In the beginning, Pablo feared that some of the services would be very expensive. Then he found out that his grandfather qualified for some low cost and free resources. Jorge receives assistance from a caregiver through In-Home Supportive Services. She helps for a few hours in the mornings on weekdays. Pablo experiences many of the same challenges as caregivers who are much older. One challenge is finding time to take care of himself. Pablo takes soccer and tennis classes. It helps him exercise and meet new people. Pablo weighs the pros and cons of how to spend his time. Sometimes, if he needs to study for a test, he asks his sister, Gloria, to help. She understands that he won’t ask for help unless he needs it. The outlook caregivers take can have an impact on their caregiving experience. Despite the challenges, Pablo is happy that he can help Jorge.